The lettuce, chard, cilantro, chives, lavender, collards, arugula, sage and oregano are ready, and soon we’ll be harvesting eggplants, broccolini, summer squash, peppers, tomatoes, and raspberries. The produce is enjoyed at Seeds Library Cafe, library learning events, and by patrons like you. 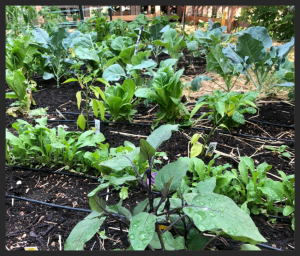 Look for Edible Learning Garden updates (including information on how to harvest and enjoy ready-to-eat crops) at the front Accounts Desk at the Main Library. The garden is located on the north end of the library, by Canyon Blvd and the Canyon Gallery.